Italy: Rome, the Vatican. Record drawing of a rectangular panel showing as grotesque work two transmogrified lions amongst rosettes and foliage in a symmetrical composition. You are here: CollectionsOnline / Italy: Rome, the Vatican. 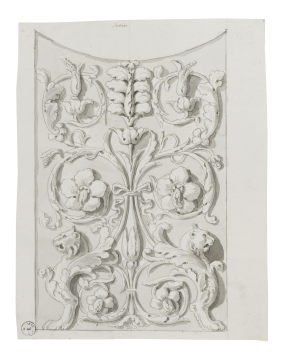 Record drawing of a rectangular panel showing as grotesque work two transmogrified lions amongst rosettes and foliage in a symmetrical composition. This drawing is a companion to those in Adam vol.26/36 and 37. Like them it shows the bottom panel of the logge doors and possibly follows those in Ottaviani print 17 (see below). The hand is close to that in Adam vol.26/61, attributed to Charles-Louis Clérisseau (1721-1820) (see T. McCormick, Charles-Louis Clérisseau and the Genesis of Neo-Classicism, Cambridge Massachusetts and London, 1990, p.142, fig.120). The decoration of the Vatican logge appeared as engravings between 1772 - 1777 in three parts: Logge di Rafaele nel Vaticano (1772), Seconda Parte delle Logge di Rafaele nel Vaticano (1776) and Terza ed Ultima Parte delle Logge di Rafaele nel Vaticano (1777). Work on the project of recording was begun in 1760 and was more or less completed by 1768. The principal artists involved were the painter Gaetano Savorelli (d.1791) and the architect Pietro Camporesi (1726-81), and the engraver was Giovanni Ottaviani (1735-1808). The third volume was engraved by Giovanni Volpato (1733-1803), after drawings by Ludovico Tesio (1731-82).